Each year, Americans consume hundreds of food products that contain truly dangerous compounds, including heavy metals, pesticides, and other harmful additives—with the blessing of the FDA. Why is this happening and why haven’t you heard about it? 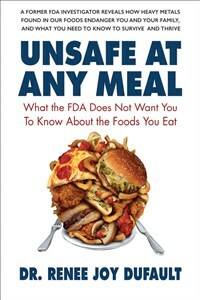 In Unsafe at Any Meal, Dr. Renee Dufault, former food investigator for the Food and Drug Administration, provides the startling answers. While at the FDA, Dr. Dufault discovered that mercury—a highly toxic metal—was contaminating the plumbing systems of many food manufacturing plants. Upon further examination, she discovered that the same mercury was also evident in a number of processed foods commonly sold in supermarkets. When Dr. Dufault revealed these disturbing findings to her superiors, she was told to stop her investigation. Her continued efforts to raise the issue always met with a dead end, so she chose to take an early retirement from the FDA. Dr. Dufault then devoted her energy to making the public aware of the insidious dangers that contaminate our food. In 2010, she founded an organization of scientists to study the scope of this problem and has published numerous research articles on the topic with little fanfare. To expose what still seems to be a well-kept secret by the FDA, she has written Unsafe at Any Meal to provide consumers with the information they need to know. The book begins with the author’s story leading up to the creation of this work. It then describes the various toxic substances that are most commonly found in our food supply, and explains how they affect your genes, health, and the surrounding environment. After examining the Standard American Diet, which is sorely lacking in disease-preventing nutrients, it discusses the country’s trend toward consuming a skyrocketing amount of ingredients that can contain heavy metals. It further shows how exposure to these heavy metals can contribute to conditions such as ADHD or autism. Also included is a helpful guide to reading food labels, recognizing misleading marketing tactics, and knowing what to look for—and what to look out for—in the aisles of your grocery store. Over fifty years ago, Rachel Carson’s book Silent Spring exposed the dangers of DDT in our food supply. Unfortunately, it seems that the problem of food contamination has actually become worse. Backed by research and first-hand experience, Dr. Dufault reveals how the FDA has failed us, and outlines how you can protect yourself and your family by knowing what to avoid and by filling your kitchen with food that is clear of toxins.